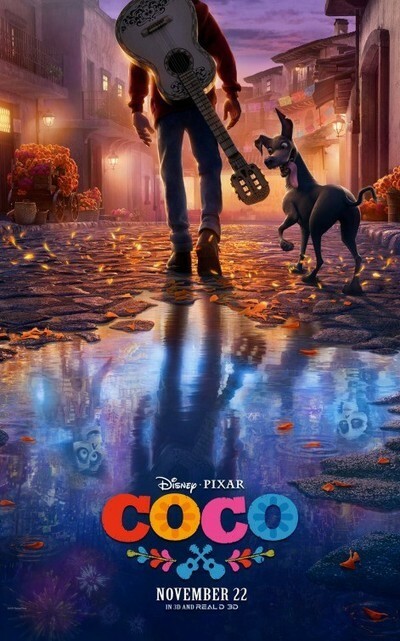 "Coco" is the sprightly story of a young boy who wants to be a musician and somehow finds himself communing with talking skeletons in the land of the dead. Directed by Lee Unkrich ("Toy Story 3") and veteran Pixar animator Adrian Molina, and drawing heavily on Mexican folklore and traditional designs, it has catchy music, a complex but comprehensible plot, and bits of domestic comedy and media satire. Most of the time the movie is a knockabout slapstick comedy with a "Back to the Future" feeling, staging grand action sequences and feeding audiences new plot information every few minutes, but of course, being a Pixar film, "Coco" is also building toward emotionally overwhelming moments, so stealthily that you may be surprised to find yourself wiping away a tear even though the studio has been using the sneak-attack playbook for decades. The film's hero, twelve-year old Miguel Riviera (voice by Anthony Gonzalez), lives in the small town of Santa Cecilia. He’s a goodhearted child who loves to play guitar and idolizes the greatest popular singer-songwriter of the 1920s and '30s, Ernesto de la Cruz (Benjamin Bratt), who was killed when a huge church bell fell on his head. But Miguel has to busk in secret because his family has banned its members from performing music ever since Miguel's great-great-grandfather left, abandoning his loved ones to selfishly pursue his dreams of stardom. At least that’s the official story passed down through the generations; it’ll be challenged as the film unfolds, not through a traditional detective story (although there’s a mystery element to “Coco”) but through an “Alice in Wonderland” journey to the Land of the Dead, which the hero accesses through the tomb of his ancestors. Family and legacy as expressed through storytelling and song: this is the deeper preoccupation of “Coco.” One of the most fascinating things about the movie is the way it builds its plot around members of Miguel’s family, living and dead, as they battle to determine the official narrative of Miguel’s great-great grandfather and what his disappearance from the narrative meant for the extended clan. The title character is the hero’s great-grandmother (Renee Victor), who was traumatized by her dad’s disappearance. In her old age, she has become a nearly silent presence, sitting in the corner and staring blankly ahead, as if hypnotized by a sweet, old film perpetually unreeling in her mind. The machinations that get Miguel to the other side are too complicated to explain in a review, though they’re comprehensible as you watch the movie. Suffice to say that Miguel gets there, teams up with a melancholy goofball named Hector (Gael Garcia Bernal), and has to pose as one of the dead with the aid of skeletal facepaint, but that (like Marty McFly returning to the 1950s to make sure his mom ends up with his dad in “Future”) the longer Miguel stays on the other side, the more likely he is to end up actually dead. What’s freshest, though, is the tone and outlook of the film. “Coco” opened in Mexico a month before it opened in the USA and is already the highest grossing film of all time there. It assumes a non-American point-of-view on spirituality and culture—not in a touristy or “thought experiment” sort of way, but as if it were merely the latest product of an alternate universe Pixar Mexicano that has existed for just as long as the other one. The film’s stable of voice actors reads like a Who’s Who of Latin-American talent: the ensemble includes Edward James Olmos, Alfonso Arau, Ana Ofelia Murguia, Alanna Ubach and, in a small role, to my surprise and astonishment, playwright Octavio Solis, who was one of my teachers in high school back in Dallas. Michael Giacchino's score is unsurprisingly excellent, as are the original songs—in particular, the future Oscar winner "Remember Me," the greatest tear-eruption mechanism to accompany a Pixar release since the "Toy Story 2" centerpiece "When She Loved Me." Like most Pixar productions, this one is filled with homages to film history in general and animation history in particular. I was especially fond of the references to the dancing skeletons that seemed to pop up constantly in cartoon shorts from the 1930s. There’s a touch of Japanese master Hayao Miyazaki in the film’s matter-of-fact depiction of the dead interacting with the living, as well as its portrayal of certain creatures, such as a goofy, goggle-eyed dog named Dante (modeled on Xoloitzcuintli, the national dog of Mexico) and a gigantic flying dragon-type beast with the personality of a plump old housecat. Also notable are the film's widescreen compositions, which put lots of characters in the same frame and shoot them from the waist up or from head-to-toe, in the manner of old musicals, or Hollywood comedies from the eighties like "9 to 5" or "Tootsie." The direction lets you appreciate how the characters interact with each other and with their environments and lets you decide what to look at. At first this approach seems counter-intuitive for a movie filled with fantastic creatures, structures and situations, but it ends up being effective for that very reason: it makes you feel as though you're seeing a record of things that are actually happening, and it makes "Coco" feel gentle and unassuming even though it's a big, brash, loud film. I had some minor quibbles about “Coco” while I was watching it, but I can’t remember what they were. This film is a classic.